The new Kia Rio will make its world debut on 29 September in Paris, at the 2016 Mondial de l’Automobile. The Rio is the Korean manufacturer’s global best-selling model, with more than 473,000 sold around the world in 2015, accounting for 16 per cent of Kia’s annual sales. The UK contributed to this with 12,115 Rios sold in 2015, which was 15 per cent of the UK’s total sales. Now entering its fourth generation, the new Rio will offer B-segment buyers a compelling package, with an attractive new design, high practicality and convenience, class-first safety technology, new connectivity features and more engaging ride and handling. 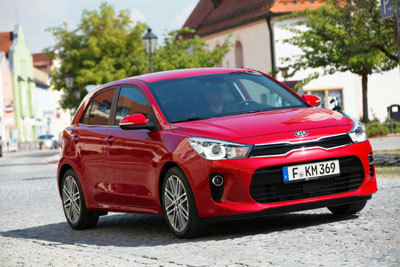 Michael Cole, Chief Operating Officer for Kia Motors Europe, commented: “The Rio is an important car for Kia, as our best-selling model worldwide. The B-segment is one of the most hotly-contested areas of the new car market, and the third-generation Rio helped introduce more people to the Kia brand than ever before. “As a gateway to the brand, the Rio has typically offered an attractive design, low running costs and practicality. It’s for these reasons that the current model has sold in record numbers around the world. The new model will build on these key strengths, with higher desirability, a more enjoyable drive and the most advanced safety features in its class." Designed and engineered to meet the needs and desires of a wider range of buyers, the new Rio will play an increasingly important role in the Kia model line-up. The B-segment is the largest market segment in the European new car market, and Kia anticipates that the new Rio will attract over 100,000 buyers in its first full year on-sale. This will place the Rio alongside Kia’s best-selling models in Europe, the Sportage and cee’d. The new Rio will be manufactured at Kia’s Sohari manufacturing facility in Korea, and will go on sale globally during the first quarter of 2017. The Rio’s progressive new exterior and interior design was led by Kia’s design centres in Germany and California, in close collaboration with the company’s domestic design base in Namyang, Korea. The appearance of the new Rio is defined by straight lines and smooth surfacing, giving the car a distinctive new look and more mature character than its predecessor. At the front, the Rio wears the latest evolution of Kia’s ‘tiger-nose’ grille, now thinner in height and wider across the front of the car, with a gloss black grille cover. The grille is integrated with the newly-designed bi-function headlights, more sculpted for a sharper look, and featuring a new U-shaped LED daytime running light signature. The Rio’s front fog light surrounds are moved outwards and upwards in the front bumper compared to their position on the third-generation model, adding greater visual width to the front of the car for a stronger overall look. The longer bonnet features bracket-shaped creases that run down from the base of the A-pillars to the grille and headlights. The rear section of the Rio is now more upright, with a near-vertical rear windscreen and a shorter overhang. The straight line that runs from the grille, through the headlights and along the top of the doors, continues around the back of the car, paired with thinner, more sculpted rear lamps, which now feature a new arrow-shaped LED light signature. Like the wider-looking ‘face’ of the car, the rear design of the new Rio gives the car a stronger overall appearance. When the new Rio goes on sale across Europe, it will be available in a choice of eight exterior colours and a choice of three aluminium alloy wheel designs, ranging from 15-inch to 17-inch in diameter. The Rio will be sold as a five door model in Europe. 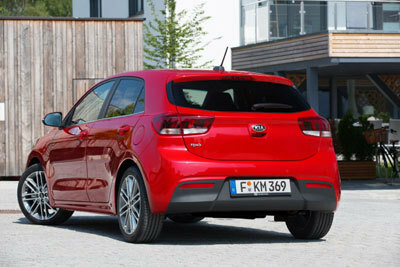 The new Kia Rio features a modern new cabin, with more sculptural forms and a more ergonomic layout than its predecessor. The interior has also been designed to accommodate the Rio’s new range of technologies. New technologies further boost the appeal of the Rio’s cabin. Designed to improve comfort and convenience for owners, the new model is available with keyless entry and ignition, heated seats and steering wheel, rain-sensing windscreen wipers, and automatic headlamps. The new model is also available with Automatic Cruise Control, with a speed limiter, and Rear Park Assist with a rear view camera (see ‘Safety’ for more information on the Rio’s new safety systems). The Rio will have the most spacious cabin and one of the highest boot capacities (325 litres) of any car in its class when it goes on sale, with practicality a key focus for the Rio’s development and engineering teams. The Rio’s 10 mm-longer wheelbase and 15mm-longer body contribute to larger cabin and boot dimensions. Leg room grows to 1,120 mm in the front and 770 mm in the rear, while the new model offers more shoulder room than most other cars in its class – 1,375 mm in the front and 1,355 in the rear. Despite the new Rio being 5 mm shorter in height than the outgoing model, front and rear headroom (1,021 mm and 966 mm respectively) are among the best in the B-segment. These improvements to space in the cabin have been achieved with a series of changes to the Rio’s packaging. These include re-profiled door trims, the adoption of new headlining materials, and changes to the shape of the dashboard, as well as more significant changes to the bodyshell of the Rio – such as the longer wheelbase. Furthermore, thinner C-pillars – reduced in width by 87 mm – and relocated door mirrors (moved up to the base of the A-pillar) help minimise the size of the driver’s blind spots and improve all-round visibility. A lower window line around the cabin and new quarterlights at the tail end of the rear doors also give the driver and passengers a better view out. The Rio’s cabin offers more storage space than before. At the base of the centre console is an open double tray to store mobile devices and other small items, and the overhead console includes an area to store sunglasses. The glove compartment is also a single-box shape. The new Rio has bottle holders in every door (to accommodate 1.5-litre bottles in the front and 0.5-litre bottles in the rear of the car) and two larger cupholders in the front. The doors also feature closed-bottom storage holes in the door handles, useful for small items such as a phone or coins. An optional armrest is available, adding further storage capacity to the cabin. Luggage capacity has also increased by 37 litres to 325 litres (VDA; +13 per cent), among the best in class. This extra space has been achieved in spite of the Rio’s rear overhang being shortened by 15 mm to 655 mm, a key element of the car’s new design. The new Rio features a split-level boot floor, which enables owners to change the height of the boot floor to fit items under the floor to prevent objects rolling around, or to keep them out of sight. The Rio is fitted as standard with split-folding rear seats and a tyre mobility kit under the boot floor. Buyers can specify an optional spare wheel. The fuel tank, which is located under the rear bench, is 45 litres in size, two litres larger than the earlier model. The new Kia Rio will be powered by a range of petrol and diesel engines when it goes on sale in 2017, each offering high efficiency and willing acceleration. An increasing customer appetite for downsized, turbocharged engines has led to the adoption of Kia’s latest three-cylinder 1.0-litre T-GDI (turbo gasoline direct injection) engines. The lightweight and compact new engine was introduced for the first time in the upgraded Kia cee’d in 2015 and is expected to account for the majority of Rio sales when the new model goes on sale. As well as offering high efficiency and low emissions, the lightweight nature of the new T-GDI engines benefit the Rio’s keen front-end handling, with less mass and inertia for the car to work against under cornering. Customers ordering their Rio with the 1.0-litre T-GDI engine can choose between 98 or 118 bhp power outputs. The 98 bhp engine produces peak power at 4,500 rpm and 172 Nm torque from 1,500 to 4,000 rpm .The higher-powered 118 bhp engine produces the same torque output across the same band of engine speeds, while power is accessible at a higher 6,000 rpm peak. Now in the latter stages of testing and development, both engines are expected to deliver sub-100 g/km CO2 emissions (NEDC, combined). The Rio’s Idle Stop & Go (ISG) system will see emissions reduced even further, pending homologation. Alongside the 1.0-litre T-GDI, the Kia Rio is offered with naturally-aspirated 1.25-litre and 1.4-litre MPI (multi-point injection) petrol engines. The 82 bhp 1.25-litre engine produces its peak power at 6,000 rpm and 122 Nm torque at 4,000 rpm; the 1.4-litre produces 90 bhp at 6,000 rpm and 132 Nm torque at 4,000 rpm. Pending final homologation tests, both engines are expected to deliver CO2 emissions of under 120 g/km. For even lower emissions, the new Rio will also be sold with a 1.4-litre diesel engine, producing either 69 or 88 bhp. Regardless of power output, the 1.4-litre diesel engine will be capable of producing the lowest CO2 emissions levels in the Rio line-up – Kia engineers are targeting CO2 emissions under 90 g/km with ISG. All engines apply power to the front wheels, either through a five-speed manual transmission for 1.25-litre and 98 bhp 1.0-litre T-GDI gasoline engines; or a six-speed manual transmission for the 1.4-litre gasoline engine, the higher-output 118 ps 1.0-litre T-GDI engine, and both 1.4-litre diesel engines. The new Rio will be one of the safest cars in its class when it goes on sale, available with a package of Kia’s Advanced Driver Assistance Systems (ADAS). The new Rio is built on high-strength steel body and features a wide array of passive safety equipment – the car is engineered to meet the most demanding crash safety test criteria around the world. Targeting a five-star Euro NCAP crash safety rating when fitted with optional ADAS technology, the Rio will be the first car in the B-segment to feature Autonomous Emergency Braking (AEB) with pedestrian recognition. The Rio’s AEB system uses a long-range radar detection system to detect potential collisions with other vehicles or pedestrians and helps bring the car to a halt*. AEB is paired with a Lane Departure Warning System (LDWS), which alerts the driver if they stray out of their lane on the road without the use of indicators. The bodyshell of the new Rio is made up of a significant proportion of Advanced High Strength Steel (AHSS). The extensive use of AHSS in the body of the Rio is part of a wider effort by Kia to achieve a 5 per cent reduction in the average weight of new car bodies by 2020 when compared to 2014, while enabling greater safety and security. 51 per cent of the new Rio’s body is made out of strong, light AHSS, compared to 33 per cent in the third-generation model. The higher application of AHSS has strengthened the passenger cabin ‘cell’ for greater occupant safety and more effective distribution of impact forces. The stronger steel has been used to reinforce the A- and B-pillars, as well as side sills, roof structure, engine bay and floor pan. The new Rio is fitted with six airbags throughout the cabin, as well as ISOFIX child-seat tether and anchor points for front and rear passenger seats. As well as being incredibly safe to drive, the new Rio seeks to build on the level of driver engagement offered by the third-generation model. Kia’s chassis development teams have sought to introduce greater driving appeal, with more agile and immediate handling, while improving ride comfort. The Rio sits on fully-independent MacPherson strut front suspension and a torsion beam rear axle. The development of a stiffer bodyshell gave R&D teams the freedom to develop a more compliant suspension system. The new Rio benefits from a revised spring and damper set-up than the outgoing model, improving the car’s compliance and comfort at all speeds, while facilitating the car’s more enjoyable, engaging handling characteristics. Compared to the third-generation model, the modifications to the Rio’s chassis include: more rigid front suspension struts and cross member and a raised rear torsion beam for high-speed stability; the adoption of new vertical rear shock absorbers and front shock absorbers with pre-loaded linear valve technology, both resulting in more linear handling and suspension response over broken road surfaces; and a repositioned power steering gearbox, to enable greater ‘on-centre’ feel through the steering wheel. The changes to the chassis are designed to endow the Rio with more immediate handling responses and improve the level of confidence that the driver has behind the wheel. On top of the new package of ADAS technologies, the new Rio is fitted as standard with Kia’s Vehicle Stability Management (VSM) with Electronic Stability Control (ESC). VSM ensures stability under braking and cornering, detecting a loss in traction and using ESC to help the driver keep the car on course. At the centre of the dashboard is the new infotainment system, housing Kia’s latest HMI (human-machine interface). The new Rio is available with a ‘floating’ 5.0-inch touchscreen audio system with six speakers. Buyers can also specify a 7.0-inch touchscreen infotainment and navigation system, with Kia Connected Services powered by TomTom®, as well asAndroid Auto™ and Apple CarPlay™ for full smartphone integration. The Kia Connected Services connectivity package offers drivers a wide range of up-to-date information, including live traffic updates**, speed camera locations and alerts**, local point-of-interest search and weather forecasts. Available in cars equipped with navigation Kia’s Connected Services will be available free of charge for European buyers for seven years after the car’s purchase. The Rio’s Android Auto system is designed to work with Android phones running 5.0 (Lollipop) or higher. Available from launch, Android Auto™ connects to the user’s phone and lets them access smartphone apps and functions through the in-car infotainment system, such as voice-guided Google Maps navigation, hands-free calls and texts and voice recognition. Android Auto™ also lets users stream music from Google Play Music™ and other services. Apple CarPlay, for iPhone 5 or newer, will enable full Siri voice control to control the phone’s various functions and apps, including navigation via Apple Maps, calls and text dictation. Apple CarPlay™ also supports other audio apps that the user may have downloaded to their iPhone – such as music streaming or audiobook services. The Kia Rio will be the first car in the B-segment to be equipped with USB ports in both the front and rear of the cabin, enabling users to physically connect a mobile device to the Rio’s infotainment system, and recharge batteries on the move. The all-new Kia Rio will go on sale across Europe in the first quarter of 2017, with the company’s unique 7-Year, 100,000 mile warranty as standard.